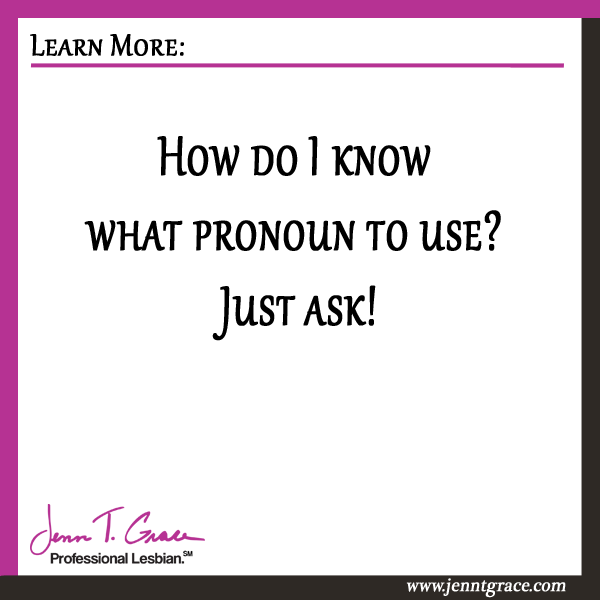 How do I know what pronoun to use? Just ask! 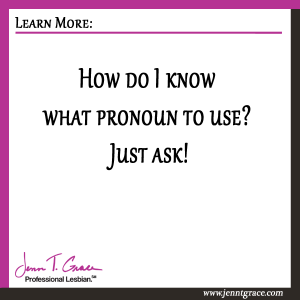 Home » All Things Transgender » How do I know what pronoun to use? Just ask! I was meeting with a colleague and we were talking about a challenge her wife had just recently faced as it related to a new LGBT person working for her. Her wife recently hired a young woman who was very masculine in appearance – what you might call a ‘butch lesbian’ (I will write about this in another blog post, promise.) Rather than wanting to be called by her legal name she asked if everyone would call her Andy. Now the challenge came in when co-workers didn’t know how to handle what pronoun to use. The difficulty is, like you, she and her coworkers are not experts in all things LGBT. 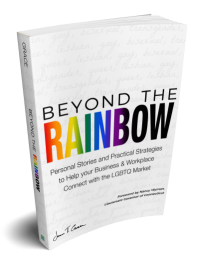 So the question is – how do you know what questions you can and cannot ask someone who is LGBT? This can be a slippery slope because you don’t want to blurt out inappropriate questions and ask someone ‘So, hey are you a lesbian?’ That is not an appropriate question to ask. Ever. However, in this particular case, this young woman approached the boss and specifically requested to be called Andy, which is a fairly androgynous name (I know Andy’s of both genders, personally.) In this situation if I were the boss, I would have said to her ‘And what pronoun would you prefer we use?’ Asking this question is squarely in the context of the conversation. She is making a request to be called a name other than her legal name (for the record I do not know what her given name is), I believe she would have appreciated that question in return. It would indicate a heightened sense of awareness among the company to know enough to ask that question. It can get very tricky when you are trying not to say he or she in any environment, even more so at work when you are interacting daily. I’ve written about this awkwardness before, read more here. The position my colleague’s wife has found herself in is that no one asked what this person’s preferred pronoun is and now they don’t know whether to say he or she. If I were that person I would be hoping and wishing someone would just ask me versus tip toeing around the issue. As someone who is young, she may not feel confident enough to be direct and say, “Please call me he.” So instead co-workers are tip toeing, which really isn’t an ideal situation for either party. If you catch yourself in a situation like this, I would advise you to just ask what pronoun they would prefer you use and go from there. I told my colleague to relay this information back to her wife, so should I get an update on what happens I will post it here. And for the record I chose to refer to this person as a young woman and she because that’s how she was presented to me. It is quite likely this is not her preferred pronoun.